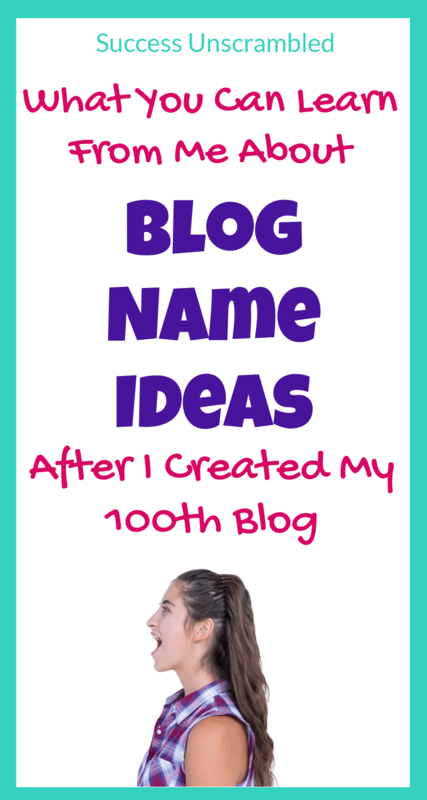 Over the last 10 years, I have managed to come up with over 1,000 blog name ideas that I used to start a minimum of 100 blogs. Yes, you read that right, I have started over 100 blogs during the last 10+ years. That means that I probably made far more errors when it comes to blogging than you have, lol! It also means that because I made so many mistakes with blog names I have actually increased my chances of getting closer to success. The one thing I have learned is that you will probably be never 100% happy with the name you finally choose. You will, however, be sufficiently content that you did your due diligence and that you chose the best possible name at the time. You can easily spend a lifetime coming up with blog name ideas without starting a blog if that is your long-term business plan. In this blog post, I will spend time with you outlining the reason why you should choose a good name and where to get the inspiration. 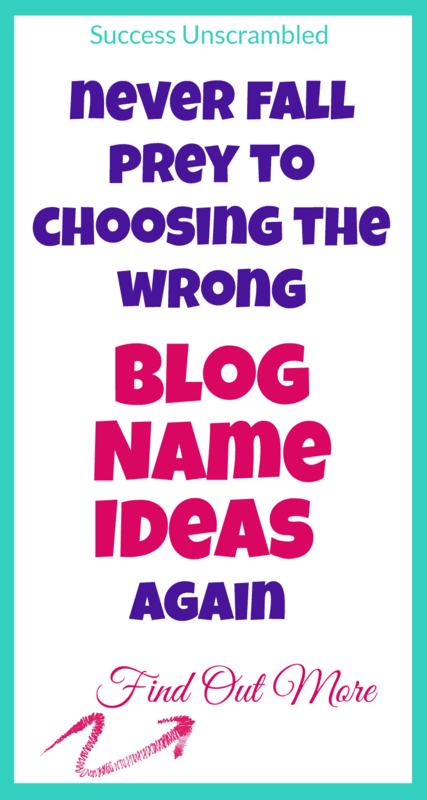 I will also advise on the best tools to help you find great blog name ideas. Well, the truth is that a blog name is like a label that describes what your blog is about and it also makes it memorable. If you have any experience doing research online you will come to realise that there are hundreds of thousands of blogs that deliver information. I know some of this sounds almost hard to relate to but the truth is every day thousands of people go online to solve a problem. There are also many resources online that can help them solve that problem but at the end of the day, they choose to use 1-2 of those blogs. Why do you think they did that? When was the last time you purchased something online? Do you remember why you chose the site that you did the transaction with? Let’s spend some time looking at a few popular websites so that you really get a chance to understand the importance of a blog name. Amazon is the world’s largest e-commerce site but before they became popular no one knew about them. Strip Amazon of their social proof, big reach, vast websites, brand and money and it is simply a name. When I hear the name I think of a big river in the Amazon forest. Let’s look at a smaller company that represents a blog. Airtable is a good example of a smaller site. When I first heard the name I thought it had something to do with tables (spreadsheets). Lemons and Basil is another good one as it tells me that it is something to do with food and it is indeed a food blog. Hairs Out of Place is another one that just sounded fun and I thought it was to do with beauty but it is essentially a lifestyle blog. Finally, eTramping is another one that to me sounded like travel and I was correct as it is a travel blog. After looking at these few examples it is time for you to remember what is your passion and purpose. The reason why I spend time focusing on this is that if you are not passionate about your blog niche then you are not going to succeed as a blogger. As you can imagine I speak from experience. I am that person who started 100 blogs and failed on many of them so trust me when I tell you to focus on your passion. What is that one thing that you can talk about even when you are tired? The one thing that brings a sparkle to your eyes is most likely your passion. 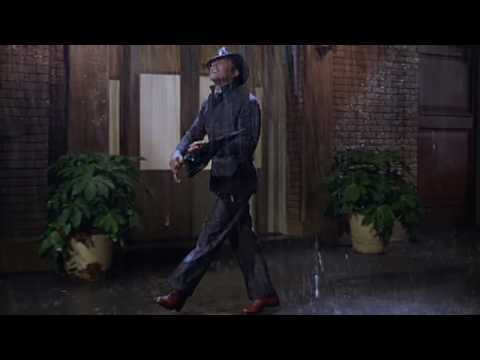 Have you ever tried singing in the rain? Better yet, what is that one thing that you will do despite the fear that you feel deep down in your mind? The main reason why I failed at blogging in the past is that I chased after niches that were popular. I was told that they “were guaranteed to make money” but I failed because I was miserable writing about topics that I had no interest in at all. After you have decided on your passion and purpose you need to decide on your offering. I know that this is going to be difficult. You may think that you don’t know enough about your niche to be considered an expert. In fact, you may not yet have a product or service to offer your audience. You may feel like a complete fraud and you may be terrified of failure. Well, I’ve been there and done that. Hey! Maybe I should create a t-shirt on that topic? Haha! If I create a t-shirt I can quite easily say that I’ve been there, done that and worn the t-shirt. Thanks so much for the idea, lol! I am obviously distracted so where were we? Yes, it is okay to fail after you have tried but if you don’t try that is worse than failure itself. Your passion plus the benefit or results that you want for your audience will give you a great blog name. Grab the thesaurus and spend a week or two coming up with a big list of possible blog names. The reason why you want to use a thesaurus is that it is possible that your blog name is already taken. You can come up with one hundred names if that is feasible. When you find yourself running out of ideas sit down with the big list. You will notice that there are 1-2 words that are pretty much consistent in a large part of your list. Take note of these words as they may be one of the final components of your blog name. It is often a good idea to include a verb if possible. Verbs indicate actions that your audience can expect from you. In my case, I wanted to include unscramble or unlock as my action word. Make a shortlist from your big list and let’s spend some time looking at the items needed to ensure success. Quick Tip – Choosing a blog name using the first 13 letters of the alphabeth puts you in a better position compared to the last 13. Here are some things that you need to be aware of when choosing a blog name. – the best letter count of your blog name should be less than 15 characters but no more than 20. The ideal length is 8. – reduce the list to the ones that are easy to remember. There is very little point in choosing a name that people will have difficulty remembering. For example, both my first and last names are very difficult to remember and spell so there was no way that I was going to name a blog after me. – one of the reasons why I decided to go with two common words is because everyone knows how to spell success and unscrambled. I don’t really need to spell my blog name for them. – your blog name should also be easy to create a brand around it. You need to remember that you will need to develop social media profiles from your blog name. Look at the shortlist again and be brutally honest with yourself. Will your brand name work well as a Twitter handle, Facebook page, Pinterest business profile and Instagram name? After going through the process you may find yourself with a list of 15-20 blog names or less. 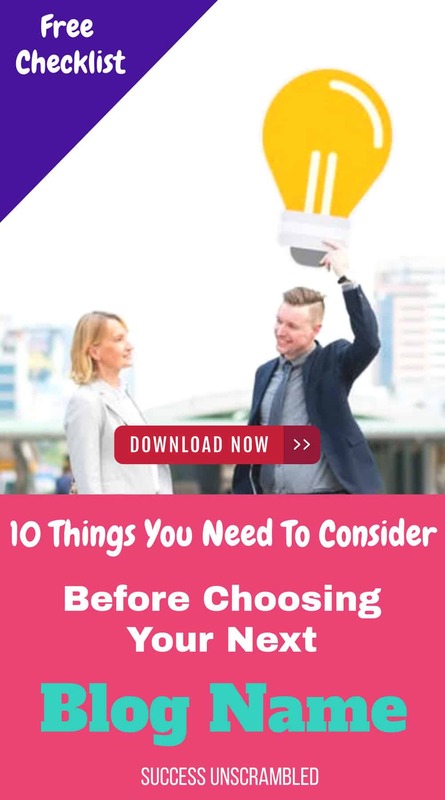 Now it is time to use some tools to help you justify your choices on the shortlist. These are sites that allow you the ability to put in a few words with the intent to generate a huge list of blog name ideas. 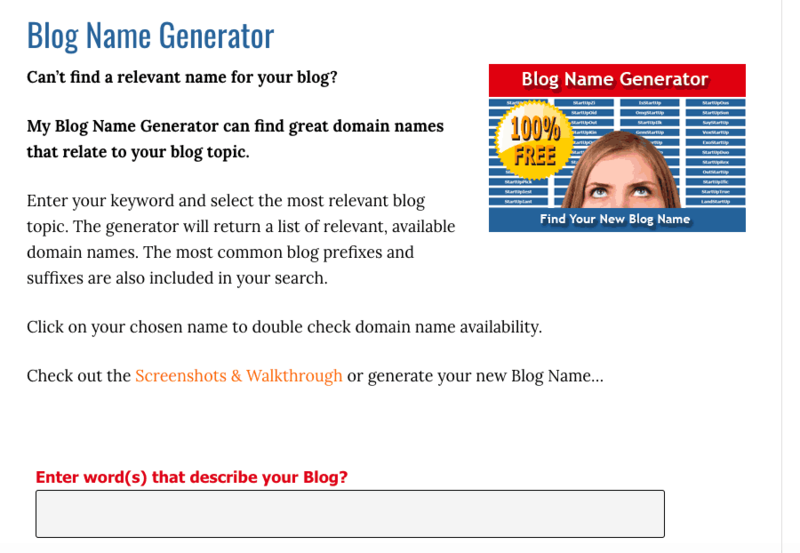 In case you were thinking of using a blog name generator to help you generate blog name ideas here is something that you should know. Blog name generators are not aware of your passions and they certainly don’t have an intimate understanding of your audience. It is better to use this kind of tool to help with the brainstorming part of the process rather than to help you find an authentic blog name. Take for example the name Google, it may sound like a name that was plucked out the air but I believe that it was a play on the name goggles. You use goggles to help you find things so the name Google was a perfect play on the word goggles. Let’s spend some time looking at what’s available on the market at present. I suggest that you only use this for inspiration to help you ensure that you have exhausted all of your options. Nothing is worse than finally choosing a domain name only to discover 10 days later that you found one that is better than the one that you finally settled on. 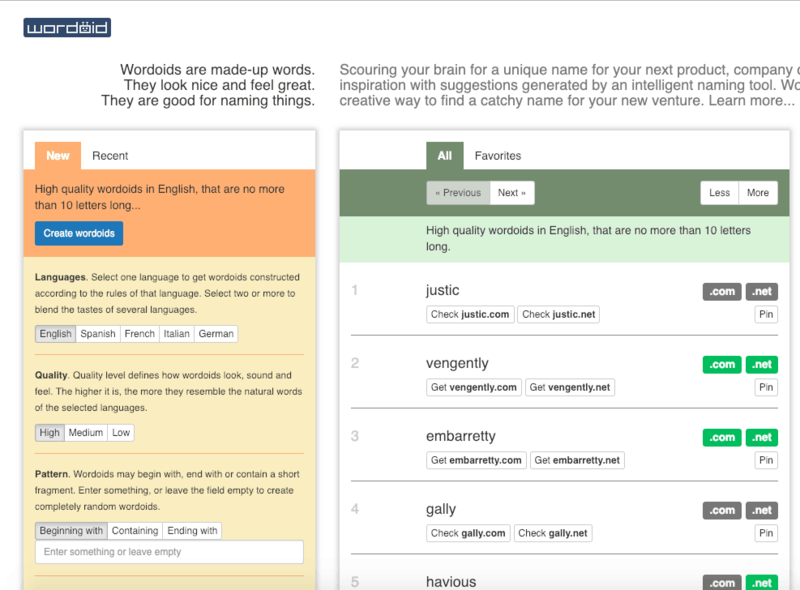 A nifty little application that lets you find possible blog names that have 10 letters or less. The only problem is that many of the suggestions sound like words you find in a Scrabble dictionary. Another great site to try and help you to come up with a unique blog name. Just enter the words that represent your site plus your niche and away you go. I have no idea if they used a blog name generator to come up with their name but at least it is memorable. This one looks like an awesome choice for finding your new blog name or even generating another huge list of blog name ideas. 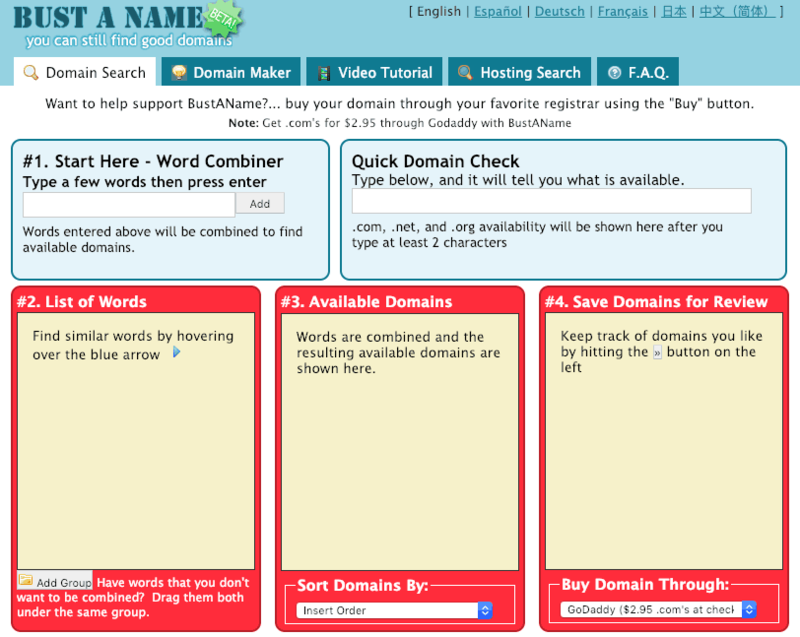 As the name suggests Bust a Name offers you the opportunity to really gather a list of options for your blog name in bulk. Just enter your important keywords. You need to know in advance which social media platforms your audience spend their time on before doing this task. For example, if your potential clients spend time on Facebook, Instagram, Twitter and Pinterest then ensure that your chosen brand name (blog name) profile is available. This is the step that I missed so my Twitter name had to be shortened which was disappointing. 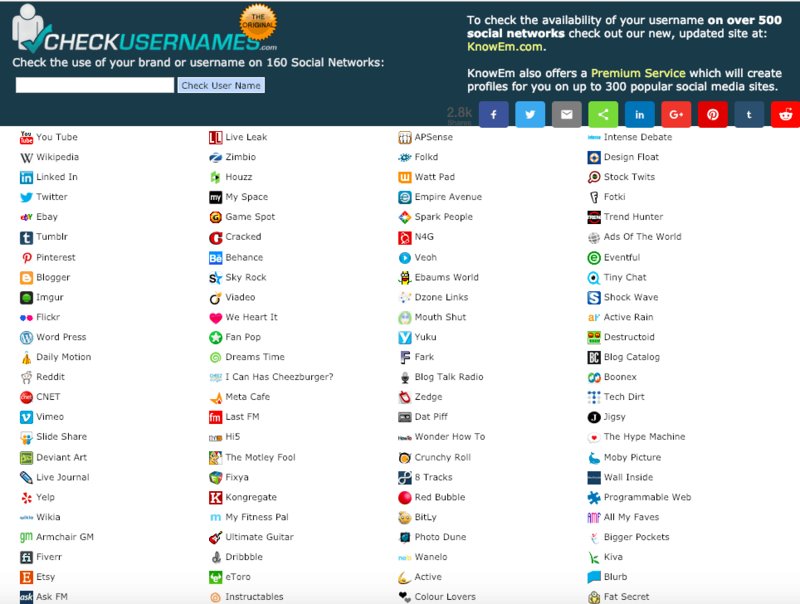 Here is the great social profile checker that you can use. It is called Check Usernames. Another super important detail that very few people take time to consider is their blog exit strategy. In other words, do you plan to sell on the blog after 10, 20 or 30 years or do you want to leave it as an inheritance for your offspring? The key reason for knowing this is that the name that you eventually choose should be one that reflects your exit strategy. So spend some time considering your blog exit strategy before settling on a blog name. Now that you are 95% sure of your blog name you may want to buy the domain name of 1-3 of the blog name ideas on your shortlist. It is very possible that they will be available today and gone tomorrow. I know the feeling and the stress of picking only one from the list. This is the reason why I purchased two and let it sit for a few weeks before I actually created the blog. Just writing this post made me see even more possible blog names. Maybe I am addicted to buying domain names after all these years. Wait! Maybe that is my actual passion? Just kidding, lol! I cannot see myself chasing after blog names all my life, to be honest. Head on over and pick up your domain name and find out about WordPress hosting as well as how to start a blog here. Over to you, what blog name ideas have you found? What are your struggles in finding the perfect blog name? Leave your feedback in the comments. If you are a Lifestyle Blogger, check out the list of 200+ lifestyle blog post ideas as well as find out about the ultimate blog planner that you can use for blog success. Nice post. I do not like blogs where you are expecting one thing from the name but it’s actually something totally different. Jolie, you are absolutely correct. I am on the same boat as you. Great advice I never do trendy titles. I just go with what comes to my head first. I don’t second guess myself and try to make it be a topic that will make a person want to know more. I’m not always successful but then again it’s for me mostly because I like to write. Lala, that’s great thanks for sharing. Finding the right name for your blog definitely sets your blog up for success. I love how you state that the name of your blog has to be something that you are passionate about. Without passion, why create a blog in the first place? Great topic! Kristen, so true, blogging can be boring and it can also be exciting if it is your passion. Alyazia, you are very welcome. I should have read this article before starting my blog! Great tips for future endeavours. Chrystal, you can use these tips for your next blog adventure. Awesome Irina, thanks for sharing your experience. I had a similar experience about 9-10 years ago. I’m so glad you caught the typo early on. Marie, that is a great name and you should be really proud of it. Jessica, that is normal. Naming a blog is just as difficult as naming a child so that is understandable. The name for my blog has been a long and tortuous choice, but I think that in the end it perfectly reflects the magic side of myself! Cristina, congrats on choosing a blog name that makes you contented. Great read! I think coming up with a name can be the hardest part of starting a new project like a blog! You want it to feel authentic, but also carry your purpose, mission, and point of view forward clearly. Not to mention finding something that hasn’t already been taken! Dani, this is so true. This is why you need to spend two weeks considering all the options. You make a lot of really valuable points here. This is a great post! I wish I had of found it when I had just started out. Better late then never! Dani, thanks for your feedback. Very good tips, I often over think my blog name as well. Brandy, it is normal to do just that. That does make great sense but when you are new to blogging it is hard to find a name that relates to your niche. Somedays I still think about if my blog name is good for what I write on my blog? I think that is a process and I get in time there and effort. Melissa, that is a fair point. You really need to be clear on your niche before making a decision. I remember that it took me days to come up with the perfect name for my blog. And I am happy that after years and years I still like it and I still continue to write about the same topics. Joanna, I’m so glad that you found the perfect blog name. That’s why I went with my name because names can really be misleading if thought through. Joan, going with your name is still a good option. Amber, your blog name is lovely. I wish I had seen this before I selected my blog name. So much thought needs to go into a name for sure. Tara, I like your blog name. I think that it is very creative. I hope I read this post earlier. I changed my blog because I changed my mind with its domain name. It’s a great tips for new bloggers, thank you for sharing. Amersky, you are very welcome. This are definitely great tips for someone first starting and wanting to find a name for their blog. Ada, thanks for your feedback. Great advice as always. I will be sure to share this post with some friends who are considering starting a blog. I am sure they will find it very useful. Awesome Alexandra, thanks for the kind compliment. great post for sure, love all the ideas! names take so much work! Yes Leah, they do take work but it can be fun. 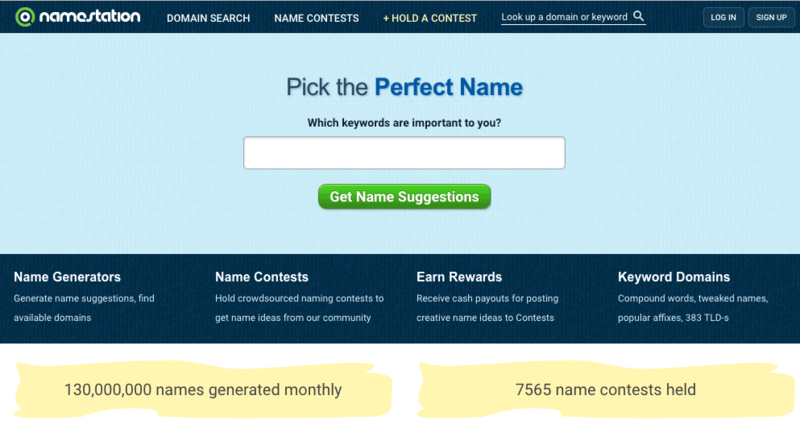 What a great guide on how to find the perfect blog name. This is great for beginners! Aisasami, thanks for stopping by. I remember when I was trying to find a name for my blog. And then someone said something and it just clicked. Heather, don’t you just love it when that happens? This is such a great guide to find the perfect name for our blog. This is going to help many bloggers including me. Thanks for sharing. Bindu, you are very welcome. Remember that it can be fun to do this exercise. These are such a great ideas. Oh I still remember when I open my blog almost 8 years ago. Of course I changed the name of the blog and all the Social Media almost 2 years ago haha. Esther, so nice to have great memories. 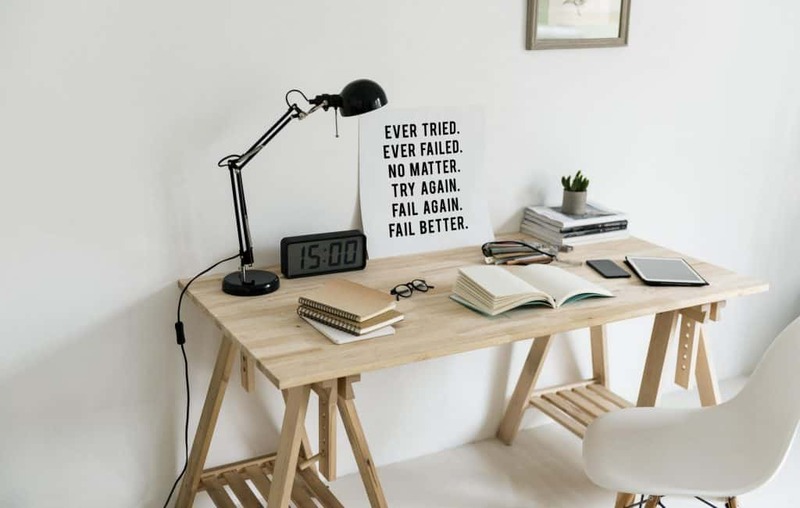 Wow Loving this quote “Yes, it is okay to fail after you have tried but if you don’t try that is worse than failure itself” You have a powerful advice great post! Maysz, thanks for the kind compliment. Awesome Sundeep, I’m glad you found a solution. Shilpa, yes indeed, an appealing blog name does make an impact. I’ve changed my blog site and blog name several times. I’m still new to blogging so I may change it again. I found a niche that isn’t popular but I like it so I’m hoping things will work out. Kay, don’t worry it is normal. People rebrand all the time. I’m so glad that you found a niche that you like. Great advice! Just timely too because 😑 one of my blogs has an awful long, long domain! Yuk! So I’m currently in this exact process too, thanks. Marilyn, that is great news. I really hope you find a domain name that is shorter and that matches you and your audience. Finding a blog name can be so very difficult and trying. I love all of this advice that you have given on being able to find the perfect one for you. Becca, I’m so glad that you liked all the advice. That was actually my problem when I started blogging, so I ended up using just my name so I would not regret it in the future. I somehow feel like I want to change the name but it’s gonna be a long process again. Jean, other people have re-branded their blogs so it is okay to change if you need to do so. I changed my blog name once because the former seems not feasible if I will target the international audience. I agree, the blog name should be easy to pronounce and type online! Blair, if only there was an easier way to come up with a blog name that is successful. Devyani, apologies for the delay in writing this blog post, lol! These are nice tips for those who thinking to start a blog. I think name should relate to the content you want to share. Swathi, yes the blog name should ultimately relate to the content you share. This is great advice! My blog name came from my Twitter name, and my Twitter name came about because I wanted a certain handle but it was taken. I had to get creative with the spelling, and then decided to brand myself with that specific spelling. Sometimes I regret it, but it’s me. Chels, I’m so glad you have a blog name that keeps you contented despite a few regrets. Thanks for a great post. It took me awhile to come up with my blog name but I’m really happy with it. Patty, I’m so glad you found a blog name that you are happy with. This is such a great post! Picking a blog name can definitely be a daunting task, but the tips and sites you gave make it a little easier! I’ll be sure to pass this along. Thanks for sharing! Nicole, you are very welcome.